So far from the new products Domo is offering I am VERY impressed with the Aroma! The aroma prior to whisking was Vanilla Hot Chocolate-type smell…VERY tempting! After whisking a stereotypical yet highly scented Vanilla Rooibos. The Color is that of a cloudy dark reddish brown. There are very small pebbles of powder floating on top which later I found to be sugary delights! The Taste is…WOW! 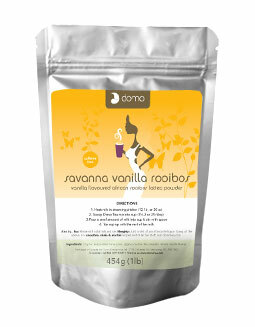 Not only is it rooibos sweet but it’s SUGAR Sweet! And a lovely Vanilla! This is very VERY sweet and sugary and treat-like! If you like sweet and you like sugar or if you try anything vanilla flavored – you will probably like this! If you are looking for something to satisfy your sweet-tooth…try this! Or if you are like me and just like trying new things! This is NEW…try it!